Today, as everything in Shenzhen is coming to a shrieking halt, for Chinese New Year’s celebration, a DHL box arrived from China at my studio, containing the first actual production model of the much anticipated AD600 PRO. If you have read my previous article, you know by now that I have been quite enamored with the H1200, the previous Godox flagship portable flash, powered by two AD600 units. Now, seeing the new PRO version in person, it is a stunning achievement by Godox, and perhaps another nail in the coffin of the established European flash brands and their ill-fated battery powered products. Make no mistake, the guys in Switzerland and Sweden still make some of the best studio units and special light shaping tools. But in terms of portable battery flash, Godox has just crowned themselves as the undisputed king of the business! The Pro is an incredibly well designed and highly efficient light and will be for sure the market leader for some time to come. Well, almost everything. The new flash tube design is a huge improvement over the AD600 and H1200 tubes, in terms of even lighting and spread. The frosted top of the tube is a very important addition, as the lack of diffusion glass was one of the big weaknesses of the previous Godox models. Without a 3rd party glass dome diffuser added, it would have been rough to use the older tubes on any optical lights and even regular parabolic reflectors and umbrellas. For my first look today, I was only interested to compare the twin H1200 with the PRO, as those are currently the two best products by Godox. But this is a tough test for the PRO, to be sure. I therefore immediately ran a few direct comparisons using some of my favorite key light modifiers, such as the Broncolor Fresnel S, various Paras, the excellent CheetahStand Colt 45, and the Elinchrom Zoom 8-36 degrees, my favorite theatrical follow spot. I also checked out both lights in the white Phottix Spartan 50cm collapsable beauty/octabox, fitted with my custom, low profile Bowens mount inserts. Each test was shot at full power, with the Fujifilm GFX 50S, at f32, 1/125 second, and the front of each modifier 6 feet from the seamless. Note: All the shots with the H1200 are a lot warmer, a result of the added, (3rd party) diffuser glass. Because of the need for added, power eating diffusion, and some additional power loss from the extension cable with the H1200 used in the fresnel spots, the Pro pretty much matches the twin head in power output. I was hoping for exactly this result. The somewhat odd shape of the H1200 tubes requires a good amount of added diffusion for a smooth result with fresnels, hence here the PRO really shines! 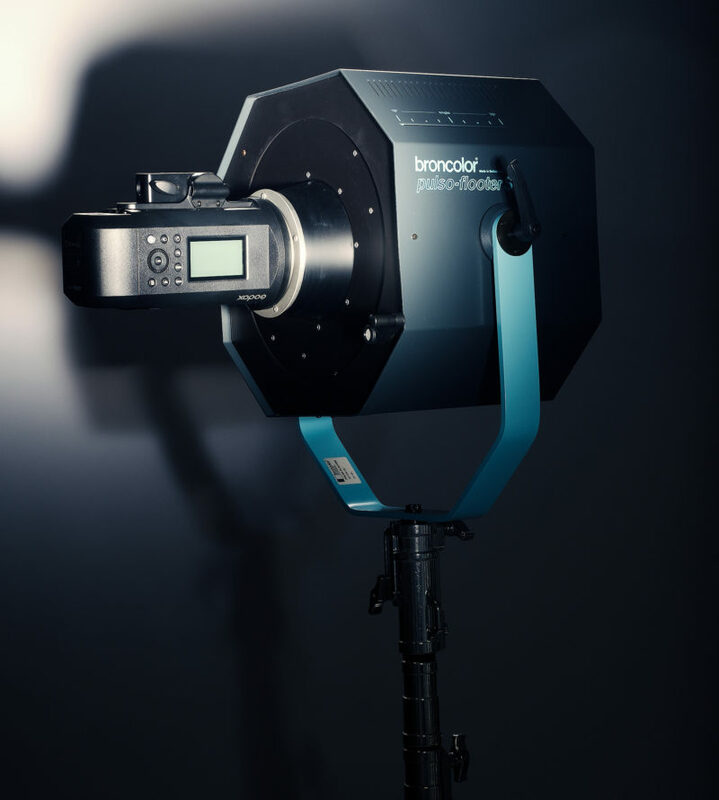 The Pro compared slightly less good to the H1200 with the Broncolor Para 88 in terms of power, and very noticeably less good with the high performance reflector by CheetahStand (Colt45), as well as the little Phottix 50cm Spartan dish. Still, overall, given that I somewhat unfairly pitted a double unit against the newcomer, the PRO did amazingly well. This is easy: The H1200 might as well not have a modeling light, as it is useless for being so weak but , the PRO’s strong modeling function is state of the art. Gorgeous unit and hugely improved stand adapter. The additional hand grip attachment will be useful for those who want to use the PRO without the new remote head. Too early to tell for me, since I really focused on comparing the look and power of the lights today, but if the battery runs out, just pop on a spare one! The new battery is nice to handle, and attaches very easily. I will probably never use the PRO at full power as a key light, because of the very slow flash duration of 1/220, just as I would not use the H1200 at full power, for the same reason. However, when shooting in HSS mode, at the highest speeds, full power will be almost always needed, and here the PRO rules with its incredibly snappy 0.9 second recycle. This is the only application where I find the H1200 to lack speed when shooting outside. The PRO will be a huge improvement for HSS shooting. This is not an either/or choice. Until it is clear whether Godox will design and release a H1200 PRO, using the H1200 and the Pro side by side makes a lot of sense. There are still some advantages of the older guy, and one now can pick and choose where and when to use which. I am extremely excited to start using the Pro, and keep my fingers crossed for Godox to release the remote heads very quickly. This entry was posted in Accessories, Fujifilm GFX, Fujifilm GFX 50S and tagged Fuji GFX, Fuji GFX 50S, Fuji GFX50S, Fuji Rumors, Fujifilm, Fujifilm GFX50S, Fujifilm Rumors, FujifilmRumors, Fujirumors, GFX, GFX 50S, GFX50S, Godox, Godox AD600 Pro, Medium Format, Super Full Frame. Bookmark the permalink. Trackbacks are closed, but you can post a comment.